A relatively well-preserved stretch of the Berlin Wall. Not only is this nearly three quarters of a mile (1.2 km) long stretch of wall along the banks of the river Spree the longest remaining bit of original Wall, it is also interesting because of the paintings on the eastern side of the Wall (hence the name). More background info: This bit of the Berlin Wall was in actual fact part of the inner Wall, i.e. not on the border proper (which at this stretch followed the opposite bank of the river Spree), but forming the edge of the border security strip towards the "friend-facing" Eastern side. However, here this inner Wall was built exactly like the "4th generation" Wall "75", used elsewhere as the actual outer Wall (i.e. "enemy-facing" – just as can still be seen e.g. at Bernauer Straße and the northern edge of the "Topography of Terror" exhibition). 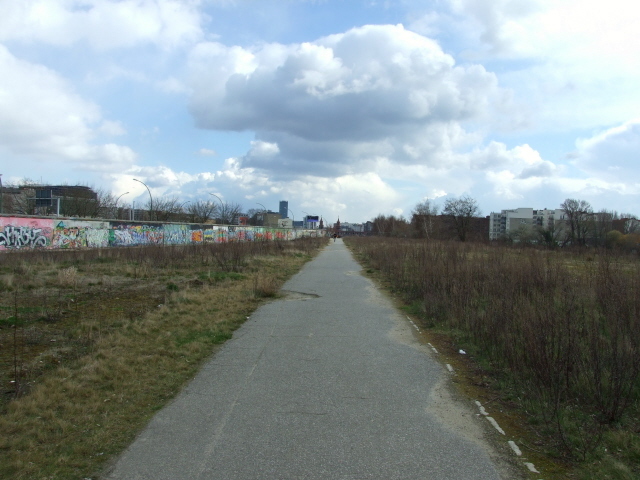 The reason for this was that the main arterial road from the East's airport in Schönefeld into the centre of East Berlin followed the course of the Wall right along the eastern side of this stretch. It was thus also the route that the GDR government's foreign state visitors would have been driven along into the city. Here this higher version of what elsewhere was the outer border Wall thus served the purpose of blocking the view, from the East, of the border security installations lying beyond, outside this wall. 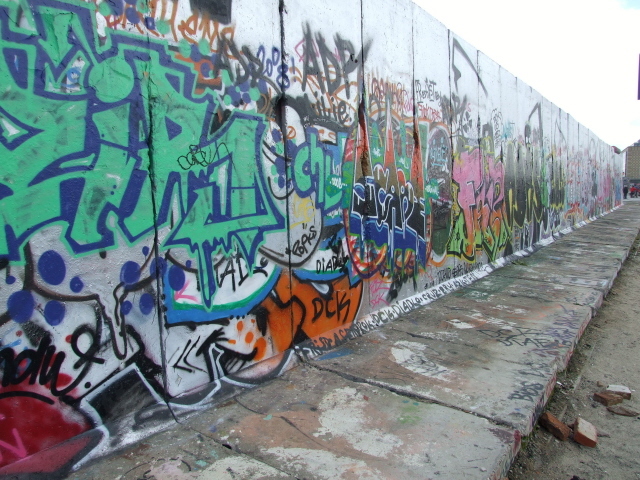 This stretch of Wall has survived thanks to the fact that it was used in early 1990 (shortly after the border opened) by international artists for a collective painting and spraying operation. The East-facing Wall usually hadn't been left the colour of the grey concrete it was made of but large white rectangular areas were painted onto it – not so much as decoration but to provide better optical contrast so that people approaching the Wall could be spotted more easily, i.e. it was part of the border security measures. The artists of 1990 then basically used the East-facing side of the Wall as a kind of canvas – it had suddenly become available, and the white rectangular areas now served as many a painting's frames. Many of the paintings left by the artist collective subsequently became quite well known – photographic images of them have been reproduced in many places – so that some are instantly recognizable. For one thing, the concrete Wall's surface had never really been suitable for "long-term" painting – moreover, the paintings were exposed to the elements for nearly two decades and were hardly looked after during those years. What made matters worse was the fact that additional "real" graffiti increasingly appeared, applied wildly over the original paintings, thus obscuring these originals in many places. Already in 2001 parts of the original artwork was "cleared up"; meaning: the surface was sandblasted away and then more durable replicas of the original paintings – or in some cases completely different paintings – were applied. But all this began to deteriorate again. When I visited in the spring of 2008, almost all of the paintings were in a very bad state, many barely discernible. More and more "wild" graffiti had appeared, often sprayed over the old paintings, but also using hitherto clear surfaces, esp. the areas on the side of the Wall facing West were covered in graffiti of the more common "contemporary" styles – i.e. primarily the so-called "tags" that are so dominant in this art form these days (and lack the artistic appeal of earlier graffiti styles that made it a semi-recognized art form … whereas "tags" are basically little more than simply "vanity graffiti"). Of course, during the days of the GDR these walls on the Eastern side of the border were "unblemished" by any colour ... other than those white rectangles. 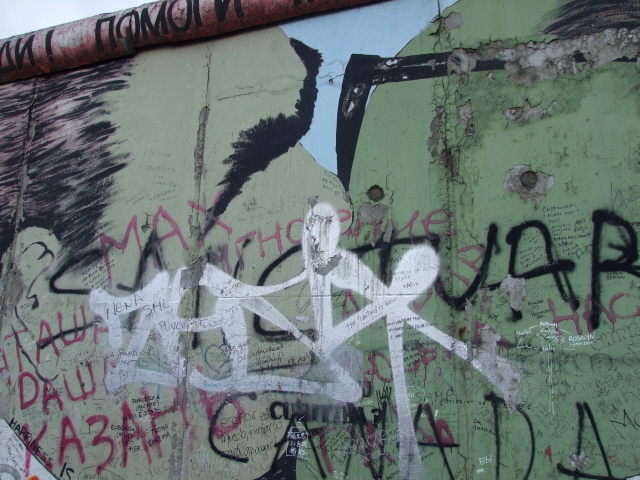 The graffiti that the Berlin Wall used to be so famous for during the Cold War period were to be found exclusively on the West-facing outer border Wall. Many of the "better" and more colourful segments of those parts of the Wall were auctioned off after the fall of the Wall. Such former graffiti naturally has to be distinguished from both the East Side Gallery's paintings as well as from the new graffiti that appeared in later years on remaining surfaces such as here at the East Side Gallery. 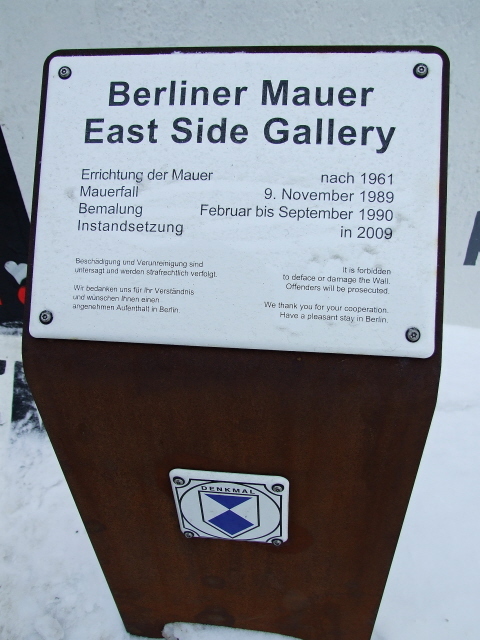 As far as the paintings of the East Side Gallery were concerned, though, it was more or less clear to most that they had a special value, at least historically because of the "gallery's" extraordinary inception in 1990. Then, when the 20th anniversary of the fall of the Berlin Wall was approaching, it was decided to give the entire East Side Gallery a full facelift and to make sure it would last longer this time. In effect this meant that what remained of the old paintings was removed (chiselled off) and then replaced with copies. Not all of the original artists were happy about this – and a few even refused to partake. This explains the odd empty patch on today's wall of paintings. Well, on my latest (2016) return visit to Berlin and the East Side Gallery I found that parts of the painted wall were about to undergo another refurbishment yet again. Clearly the warning signs were not entirely successful in deterring wild graffiti. What's worse, though, is that more of the original Berlin Wall character has been lost due to new buildings encroaching on it, and more gaps have been cut into the wall itself. Yet the site appeared to have become even more touristified since my previous visits. The place was teeming with coachloads of selfie-taking tourists and the souvenir trade seemed to be booming more than ever before too. Well, Berlin is a popular general tourist destination and I guess this is one of the most iconic Berlin Wall relics, so it's not really surprising. What there is to see: Mainly a pretty wild and eclectic mix of paintings covering most of the eastern side of the remaining Wall along the Mühlenstraße road, stretching between the Ostbahnhof station and the Oberbaumbrücke bridge. The East Side Gallery is regarded as the largest open-air gallery of paintings in the world – so there are a lot of them to see. The "content/message" of the various paintings varies widely (as does the "artistic value" – as far as that is "quantifiable" at all), but many are predictably of a "hopeful" political nature. 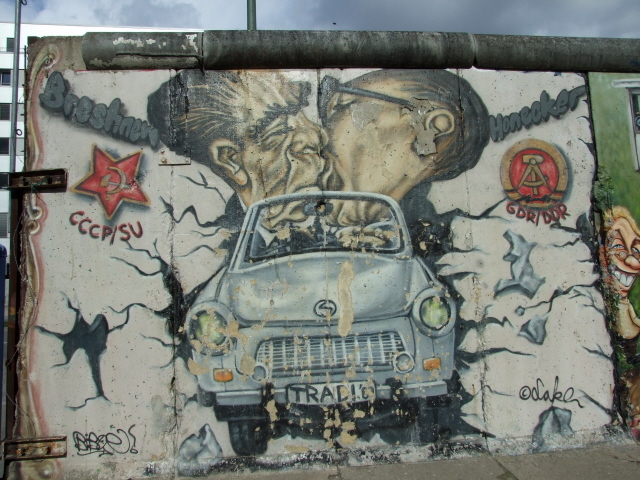 Probably the best-known image is that of an East German "Trabbi" car breaking through the Wall – or that of Brezhnev and Honecker's full-on "brotherly kiss". A smaller reproduction of this image forms part of a newer, independent wall painting near the souvenir stall further down the road – note that this is NOT the original! Some paintings are unabashedly political in the message they convey, some are more obscure and/or abstract. Some are quite funny, others rather dull. A few are more radical – yet others are almost endearingly naïve. Some go too far and are plainly fatuous and almost painfully "kitsch", yet others will delight the darkly inclined viewer with an eerie grimness. The latter is very much the exception though. Naturally, each viewer can form their own opinion in such an extremely public location. Note, though, that if you don't know German, several explicitly worded "messages" will remain opaque to you. A most visible physical limitation of the impression of the Wall is the fact that the formerly uninterrupted stretch of wall now has a big gap – some 50 yards wide, to allow access to the river, where there's a landing stage. This is associated with the nearby huge event arena (on the site of a former freight train station), of the contemporary sort that annoyingly rubs its corporate "branded" name into your face ... so I won't do them the favour of naming it here too. At the landing stage there is also a new shop selling souvenirs related to the East Side Gallery and Berlin in general. The area around, formerly the border strip with patrol track, watchtowers, etc. has been and is still being turned into a riverside park. Whether the riverbank strip will at least remain an open space remains to be seen – at such a prime real estate spot there's always the risk of developers gaining the upper hand, but with at least part of the riverbank designated a public park, there is hope it won't further mar the impression of the still longest stretch (despite the gap) of preserved Berlin Wall in the city. UPDATE May 2016: unfortunately, on my recent re-visit I found one massive blot on the whole wall atmosphere: a brand new tower block (of presumably luxury apartments), right by the wall, and with yet another gap in it. This building, whatever its architectural merits may be in its own right, is a serious detraction from the former border strip authenticity. And given this precedent, I fear more such detractions will be likely to follow in the future. At least the gap(s) in the Wall allow easy access to the other side of the Wall, that facing the riverbank to the west. But the original border atmosphere is very much marred further by the tall LED advertising billboard screen towards the southern section of the wall. Further towards the southern end of the East Side Gallery there is another, smaller gap in the wall and behind it an older souvenir shop. This has been selling all manner of GDR memorabilia – including the obligatory morsels of Wall concrete (whether really from the original Wall or not) – for much longer than the shiny new one further up the river. It is now itself a piece of memorabilia, as it were. They even advertise that they'd stamp your passport (with an old GDR stamp). Beyond the southern end of the Wall, the architecturally remarkable red-brick Oberbaumbrücke is worth a look too. It's the bridge that these days takes both the metro as well as cars and pedestrians across the Spree river. During the GDR days it was closed for traffic, but there used to be a border crossing point for pedestrians at the head of the bridge – this has disappeared without a trace, but a small information panel about the former border crossing point has been put up. Finally, on the rooftop of the cream-coloured converted warehouse building on the riverside between Oberbaumbrücke and the southern end of the East Side Gallery Wall you can spot a kind of watchtower – only minus a tower proper (the building it sits on provided more than sufficient height), making it look a bit like a small air-traffic control tower. This was another one of the border observation command posts. The building today is home to a large hip restaurant with a beer garden. The same building now also houses the new “Wall Museum East Side Gallery”. Overall, I'm afraid I must say that the East Side Gallery has lost quite a bit of its original character and hence its dark-tourism appeal. It has basically become firmly embedded in the city's mainstream tourism and that comes with some adverse effects. Furthermore, even though the Wall as such is protected as a historical landmark, parts of the area around it clearly are not and thus encroaching developments further detract from the former authenticity of the place. Hence the comparatively low ratings at the top of this chapter. 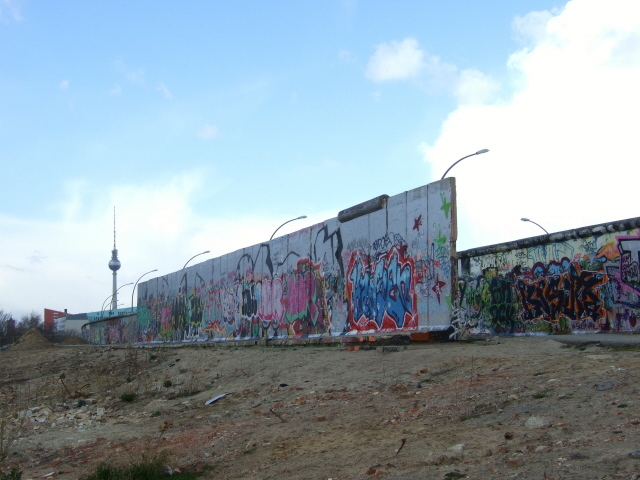 It's still worth seeing – but do not expect to get an impression of what the Berlin Wall really used to look like. Location: in the Berlin district of Friedrichshain-Kreuzberg, south of the city centre and the district of Mitte, parallel to the street Mühlenstraße east of the Spree river, between what is now the Ostbahnhof or Eastern Station (formerly the East's Hauptbahnhof, or Central Station) and the Oberbaumbrücke bridge, opposite/east of the old district of Kreuzberg. Access and costs: easy, free. Details: as the "gallery" is an open-air site in a public street it is freely accessible at any time. You can get there either by walking south from the Ostbahnhof (Eastern Station, also an S-Bahn stop), or north from one of the U-Bahn metro/subway stops (U3) of Warschauer Straße (in Friedrichshain) or Schlesisches Tor (in Kreuzberg). The paintings on the eastern side of the Wall are not so easy to view from what little pavement space you have between the Wall and the busy road. If you want to view them from a greater distance, you have to cross this road. The western side of the Wall (at least part of it) can be viewed comfortably from the newly developed park along the river, accessible through the wide gap in the Wall by the boat station/modern souvenir shop. From here you also get a good view of the Oberbaumbrücke. Time required: between about half an hour and a full hour – depending a bit on how deeply you want to get into contemplating the artistic side of the Wall (on its eastern face). Combinations with other dark destinations: in general see Berlin. One of the newest additions to Berlin's Wall-themed portfolio can be found right at the southern end of the East Side gallery, within the Mühlenspeicher building: The Wall Museum East Side Gallery. It is also interesting to continue a Wall-themed walk further south towards the district of Treptow. First cross the Oberbaumbrücke bridge, then turn left and walk down Schlesische Straße and cross the Landwehr and Flutgraben canals (en route there are good opportunities for lunch-break, esp. at one of Kreuzberg's ethnic restaurants that are exceptional value for money!). You then get to an area of open green parkland – this is called Schlesischer Busch, formerly this was GDR border territory, and the main reason for coming here is the fact that there's a border watchtower still in situ (in fact one of only three surviving ones!). But here there are also some Wall fragments and remains to be seen, as well as some border security installations which had the original purpose of blocking access to the Flutgraben canal in order to prevent people fleeing to the West through the sewer system (this is the only such installation still to be found in Berlin). You can also still see some old border barricades in the water near the banks of the river Spree. Further south-east the street Puschkinallee eventually leads to the Treptower Park with its massive Soviet War Memorial. Combinations with non-dark destinations: see Berlin – in the immediate vicinity of the East Side Gallery there is little of interest to the "normal" tourist – except perhaps the Oberbaumbrücke bridge itself, which really is a remarkable little gem architecturally; maybe parts of the "alternative neighbourhood" ('Kiez') of Friedrichshain-Kreuzberg will be of interest to tourists with a taste for such vibrant, subcultural parts of the city with its wide-ranging ethnic mix and cheap eateries (many organic or even vegan).